Apple announced the new iPod nano 5th generation and reduced the prices of iPod touch models, last week at the Apple music event. As the name indicates iPod nano range of music players is very thin in size. They compete with Microsoft Zune, Sony Walkman, Creative Zen, etc. in the portable music player market. The major specialty of 5th generation iPod nano is that it includes a camera. We just now spotted new camera enabled iPod nano on Apple India website with 8GB and 16GB models. Apple iPod nano 5 th generation will be available on seven brilliant colors, and at 9500 INR-starting price in India. The video camera on iPod nano 5 is capable is recording videos at 30 fps on H.264 VGA and AAC audio quality. There is a set of video effects that you can add to enhance the captured video. 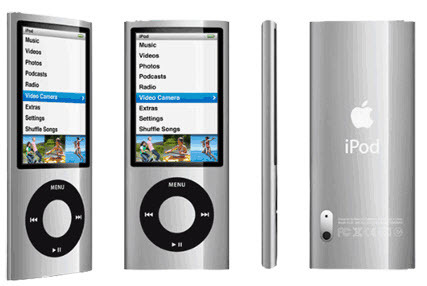 iPod nano 5th generation can hold up to 2000 to 4000 ACC encodes music files or 7000 to 14400 iPod compatible images respectively on its 8GB and 16 GB models. Measuring 90.7h*38.7w*6.2D mm externally, the new iPod nano sports an excellent 2.2 inch TFT display with 276*376 pixels resolution. The total weight of the device is 36.4 grams approximately. Built in rechargeable lithium ion battery supports continues 5 hour video playback or 24 hour music. The battery would take up-to 3 hours for a full recharge. iPod nano 5 system requirements. Windows XP or Mac OS with latest service packs. iPod nano 5th generation, Earphones, USB cable, Dock adapter and documentation. 8GB and 16 GB models of iPod nano with a camera will cost 9500 INR and 11300 INR respectively in India. Prices of iPod touch models were also revealed at the Apple event. The latest iPod Touch portable music players with OS 3.1 will cost 12.5k, 18.5 k and 24.5 k for 32GB, 16GB and 64GB. Update: iPod nano 6th generation is now available with multi-touch screen. where can i purchase it(am resident of Madurai(Tamil Nadu)? Check out the apple website…i guess u can purchase it in coimbatore, nearest to ur place….well dude, why dont u shop online??? u get stuff for less price and that’s good!!! where can i buy it in ludhiana.. pls.. answer me fast… and wats the price here..